Combining public cloud services and on-premises storage could become the most common way of using the cloud for storage; both of these methods of storing data require users to make choices and educate themselves on the available products, services and possible pitfalls. 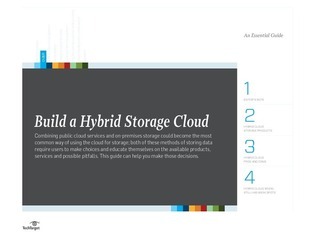 This e-guide focuses on helping you make the right choices when it comes to your hybrid cloud, introducing products, detailing the pros and cons, and identifying weak spots in the technology. Access now for more detailed discussions of these topics and to learn if a hybrid cloud will benefit your enterprise.